The Copley Society of Art has a long and illustrious history of famous artists that have displayed their artwork here. Famous artists include Loïs Mailou Jones who was born on November 3rd in Boston, Massachusetts in 1905. She was active not only in the United States but also in Paris, France and Port-au-Prince, Haiti. Her career lasted seven decades and during that time she was an influential teacher and artist and had participated in many exhibitions including the "Contemporary Boston Afro-American Artists" exhibition right here, at the Copley Society of Art, in 1989. Throughout her long career her styles would vary from pastoral landscapes to African-style abstraction. Jones was highly influenced by the Harlem Renaissance and her countless international trips. She was also influenced by her natural surroundings in Martha’s Vineyard where she and her parents spent their summers. Her art not only varied in style but medium as well. From textile design to paintings and illustrations, these artworks are nationally recognized and continue to be a topic of art historical research today. Jones’s family largely impacted her decision to pursue the arts as they encouraged her advanced talent and ambiton. She studied art at Boston High School of Practical Arts, the School of the Museum of Fine Arts, Boston, and the Designers Art School of Boston. She would eventually move to North Carolina to teach. Here she established an art department at the Palmer Memorial Institute. During her teaching career at Palmer she also taught folk dancing, coached basketball and played the piano for Sunday Services. Her student exhibitions at Palmer gained attention from Howard University in Washington D.C. where she joined the faculty in 1930. 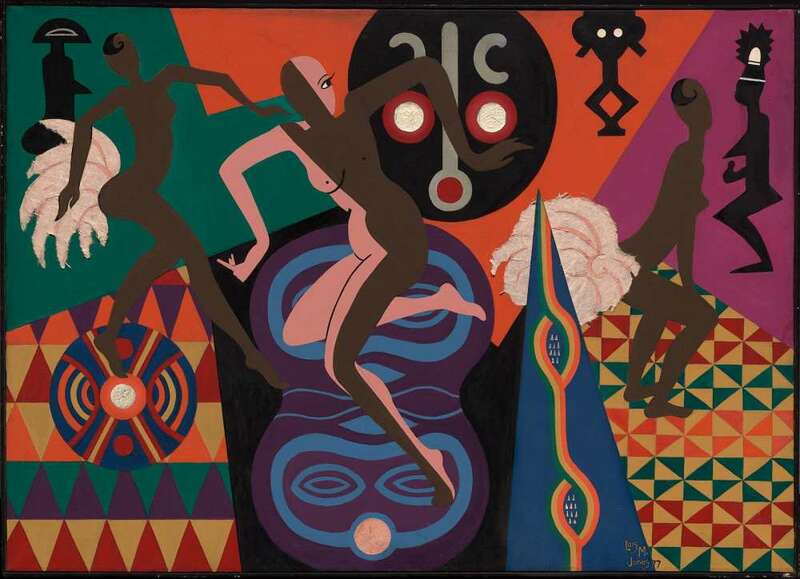 In the 1930s Jones’s art reflected the influences of African traditions as seen in her oil painting, Les Fétiches. In 1953 she married Louis Vergniaud Pierre-Noël. The Haitian, graphic designer influenced her even more as she saw the bright colors and bold patterns of Haitian art during trips to her husband’s home. To see Loïs Mailou Jones’s work, you can currently visit the Museum of Fine Arts and see the piece pictured above, La Baker, as well as many other pieces by her dating from the 1920s to the 1980s.